Menorca Holidays Free Child Places 2019 @Web2travelDeals. Online Since 2000. Finding the Best Value Holidays with Free Child Places Menorca from U.K. airports. Popular resorts include Santo Thomas, Arenal D’en Castell, Cala’n Blanes, Cala’n Bosch, Cala Galdana, Cala Santandria, S’Algar, Son Bou. Stop wasting time checking website after website, looking for Menorca Holidays Free Child Places 2019, only to find that the deal advertised has expired or does not exist. View Holidays Genuine Free Child Places Menorca 2019. We understand from reading online reviews, how frustrating it can be for you, when searching for hours for Family Holidays Menorca, only to find that the headline deals advertised are only available in May or September or twice the price during the School Holidays. Menorca Holidays @Web2travelDeals is designed to save you time and money when searching for Free Child Places Menorca 2019. We regularly check with Top Tour Operators to find out which Menorca resorts have holidays from the UK to Menorca with Free Child Places School Holidays. You can search and compare deals from all the Top Tour Operators on web2travel.co.uk, such as First Choice, Tui, Thomas Cook, Jet2holidays. Once you have found the perfect place for your getaway, you can book your family holiday online direct with the Company using one of our quick links shown below. Based on our extensive experience of helping people like you find the best value family holidays over many years, we have created a series of blogs to help you find holidays with genuine Free Child Places in popular destinations. 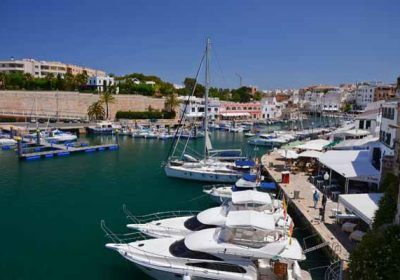 This post Menorca Holidays Free Child Places 2019 shows you hotels and apartments which our team have visited to check that free child places were available during School Holidays, on the date that this post was updated. Get More Information, and claim your Free Child Place Marina Parc Hotel, Arenal D’en Castell, Menorca, Spain. Get More Information, and claim your Free Child Place TUI FAMILY LIFE Mar de Menorca, Cala Canutells, MENORCA. Get More Information, and claim your Free Child Place Globales Apartamentos Binimar – All Inclusive, Cala’n Forcat, Menorca, Spain. Get More Information, and claim your Free Child Place Hotel Victoria Playa, Santo Tomas, Menorca. Hotel Victoria Playa, Santo Tomas, Menorca, Spain. Get More Information, and claim your Free Child Place Mestral and Llebeig Apartments, Santo Tomas, Menorca, Spain. The following properties are offering free child places for summer 2019 holiday season. (At the time of posting) Deals below are for previous years. We are still checking availability for 2019. Mestral and Llebeig Apartments, Santo Thomas. Marina Parc Hotel, Arenal D’en Castell. Holiday Village Menorca, Cala’n Bosch. Taylot Apartments Cala’n Forcat. Hotel Victoria Playa, Santo Thomas. Free Child Places Globales Apartamentos Binimar, Cala’n Forcat, Menorca. 3 star. Free Child Places Talayot Hotel Apartments, Cala’n Forcat, Menorca. 3 star. Talayot Apartments, Cala’n Forcat, Menorca. 3 star. Free Child Places Mestral and Llebeig Apartments, Santo Tomas, Menorca. 3 star. Free Child Places Hotel Sur Menorca, Punta Prima, Menorca 3 star. Free Child Places Tofinis, Ayia Napa, Cyprus 3 star. Free Child Places Hotel Victoria Playa, Santo Tomas, Menorca 4 star. Free Child Places Marina Parc Hotel, Arenal d’en Castell Menorca 4 star. 4 star All Inclusive Marina Parc Hotel. 3 star Self Catering Villas Amarillas, 3 star Self Catering Villas Maribel. 2 star Self Catering Talayot Apartments. 3 star Self Catering Menorca Sea Club Apartments. Free Child Places available at the 4 star all inclusive Holiday Village 7nts family of 4 Total price from £2847 (Dep Glasgow July) Holiday Village. 3 star Self Catering Roc Lago Park Apartments, 3 star All Inclusive Nuramar, 4 star All Inclusive Viva Menorca, and 4 star All Inclusive Paradise Club. 2 star Self Catering, Alta Galdana. 4 star Half Board, Sol Gavilanes Hotel. 4 star All Inclusive Prinsotel la Caleta. 3 star All Inclusive Las Palmeras Apartments. 2 star All Inclusive Mestral and Llebeig Apartments. 4 star All Inclusive Victoria Playa Hotel. 3 star All Inclusive Hotel Sol Milanos Pinguinos, 3 star All Inclusive Royal Son Bou Family Club. This post is designed to save you time and money when searching for Menorca Holidays Free Child Places 2019. This post Menorca Holidays Free Child Places 2019 shows you hotels and apartments which our team have visited to check that free child places are available. Holiday Village Menorca Cala’N Bosch, Menorca, 4 star All Inclusive from £2848 (family of 4) Dep Glasgow in July. Marina Parc Hotel Arenal D’En Castell, Menorca, 3 star, All Inclusive from £2409 (family of 4) Dep Glasgow in July. Talayot Apartments Cala’N Forcat, Menorca, 3 star, 1 bedroom Self Catering from £1724 (family of 4) Dep Glasgow in July. Victoria Playa Hotel Santo Tomas, Menorca, 4 star, Family Room, All Inclusive from £2424 (family of 4) Dep Glasgow in July. The above prices were taken from Tour Operators websites in 2015 based on departure dates in Summer 2016 and include 1 free child place. Our experience has shown that the number of Free Kids Places is generally limited and you should try and book as far in advance as possible to guarantee a place for your family holidays. View more destinations for Holidays Free Child Places from the UK with free child places at www.web2travel.co.uk. Holidays without free child places may be cheaper.